The area of Devon offers a few great options for your perfect spa break. The first is the Torquay Imperial situated right on the water front and offering stunning views over the bay. This venue is a sight for sore eyes. Relax by the outdoor pool or take in the views on your balcony seating - perfect a trip away at any time of the year. We also have the Dartmouth Golf Hotel & Spa which offers excellent hotel and leisure facilities located just minutes from the centre of Dartmouth. All 35 en-suite bedrooms have a light and airy feel to them and are decorated with a modern touch. A spa deal in Devon will bring you to a county which not only offers beautiful beaches and stunning views of the coast line and ocean, but also rural and country towns and villages, all offering visitors something different. 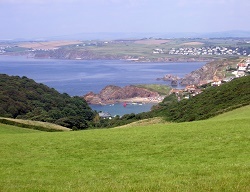 Devon also has two National Parks and The South West Coastal Path which will been any keen walkers and explorers busy all day. If you’re after more of an adrenaline rush, Devon has many areas for climbing, white water rafting and a host of white-knuckle adventures. What could be better than a morning of adrenaline fuelled fun, then relax and recuperate in your chosen spa all afternoon and get pampered by the pool. Guests don’t just come to Devon for a spa break, the food in this area is renowned for being some of the best in the country. From the dairy and blueberry farmers to the chilli farmers, coffee roasters, vineyards and micro-brewers - every locally sourced ingredient is of the highest standard, all coming together to make a fabulous meal. Whether you’re fine dining in the hotel, having a spot of lunch in a traditional pub or just grazing in a café you’re guaranteed to find whatever takes your fancy on the menu.